It’s refreshing and delicious. All you could ever want in a smoothie. The cucumber and mint flavors pop to make this the perfect morning smoothie needed to fully wake you up. It’s not just the flavor we’re excited about with this smoothie, but the Superfood Fiber. 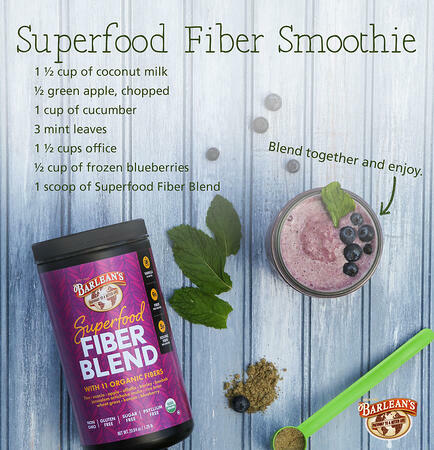 Using our brand new Superfood Fiber Blend, this smoothie sneaks in 9 grams of fiber per serving coming from 11 different organic fibers like Jerusalem artichoke inulin, wheat grass and blueberry. This fiber blend was created to powerfully support your digestion and provide valuable antioxidants. And, it’s a great boost to your daily smoothie. When will I be able to purchase fibers? By the end of October.